If your dog or cat has any special dietary needs, please let us know. We like to keep our human and animal friends satisfied! Available in the greater Cape Town area, Stellenbosch, Somerset West, Kleinmond, Hermanus and the Elgin Valley, and Langebaan. Welcome to the delicious part – what’s on the menu for dinner! We want to empower you with the knowledge of exactly what your pet is eating and why. 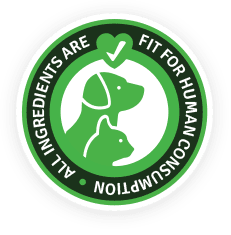 This page describes how our raw dog and cat food is prepared, what ingredients we use, and a bit of the theory and scientific research behind each recipe. But many of our clients are already very knowledgeable, so if you know what kind of dinners, whole foods, meat minces, special recipes, treats, or supplements you are looking for, feel free to browse or download our menu here. Hints and guidelines on how to switch your pet to raw food or maintain a raw food diet can be found here. Like humans, cats and dogs need variety in their diets, and they all have different health needs, so we have lots of options for you. Before we break down the details, let us tell you what applies to all the food we have on offer. We only offer real, fresh, raw foods – no added salt or preservatives. The dinners have appropriate supplements added, but these are minimal and are all natural – details to follow. You are always welcome to come visit and see for yourselves what goes into the food and how it is made. 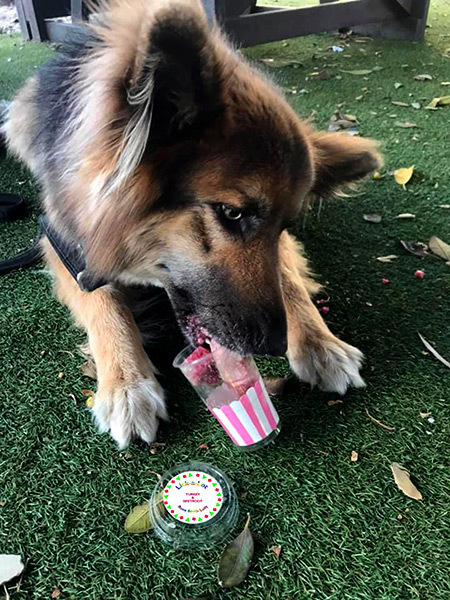 If you bring your furry friend along to our shop, they may even be lucky enough to sample a treat or two, and will certainly be subjected to many cuddles! All our foods are packed and frozen in re-sealable bags (ranging from 100g to 1kg). Simply defrost and serve! 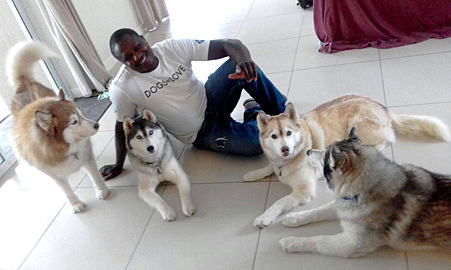 We have a very extensive delivery route to all corners of Cape Town, as well as outlying areas from Hermanus to Langebaan (email us for the full schedule), so we bring delicious pet wellness right to you. You are welcome to place a regular order for delivery to your doorstep, or ad-hoc orders. Our regular delivery customers all agree that it brightens their day to see our wonderful driver Aubrey appear at the door, always with time for a smile and a cuddle for the pets who rush to greet him with hungry eyes! 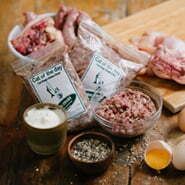 Our Menu offers two general approaches to raw feeding. The first is our minced, prepared dinner recipes, which have a balanced blend of ingredients. The second is the single ingredient options – whole meaty bones, or minced meat / offal. We feed our own dogs and cats a combination of the two, and that’s what we recommend to our customers too. Variety is the key to balance, and this way they get the best of both worlds. Our pre-made dinners for both dogs and cats are carefully designed to include a balance of all the nutritional elements they need, and our whole foods give them a huge amount of joy as well as many health benefits (more details in a bit). These are our registered dinners which have been lovingly hand-prepared for maximum deliciousness. They are nutritionally balanced, minced, pre-mixed blends. We also make “chunky” versions of our cat and dog Free-Range Chicken, which is partially minced with some whole pieces of meat in it. Give a Dog a Bone recipes all have fresh raw meat and bone cuts, organ meats, and eggs, with a small amount of fruit and vegetables. The average ratio across our dinners is 78% meat and bone, 10% offal, 11% vegetables and fruit. They are boosted with natural supplements, including deep sea kelp, apple cider vinegar, and homemade yoghurt (1%). The calcium-phosphorous ratio in our dog dinners averages at 1:1. 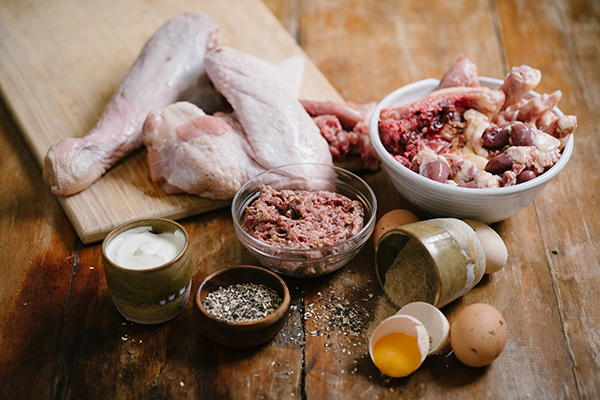 We offer Free Range Chicken (finely minced or chunky), Venison, Beef, Tripe and Turkey Dinners. Cat of the Day dinners are made of pure meat and bone (87%) and offal (11%), with some egg yolk, homemade yoghurt, and essential supplements (2%), including extra vitamins, taurine and deep sea kelp. The calcium-phosphorous ratio averages at 1.1:1. Free Range Chicken and Turkey are the two protein options offered. All our meals are conveniently packed in smaller or larger bags to suit your needs (from 100g bags for teeny kittens to 1kg bags for big dogs!). For questions about food quantity and mealtimes, please contact us. Each pet’s needs may differ slightly and we are always on hand to help you get the quantities right for your furry family member. We are also happy to help you work out your pet food budget. Please do feed your cats and dogs some Whole Foods. If you prefer to feed your own home-made pure Prey Model or RMB diet, you can find a wide variety in this section, and can even combine with our Pure Meat Minces (some with bone included) to create your own meals. 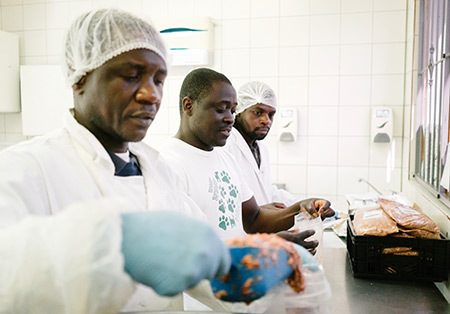 Proteins on offer include Free-Range Chicken, Venison, Ostrich, Pilchards, Beef, and Turkey, in various whole cuts or minced. One of our favourite Pure Meat Minces is Green Tripe – known to many raw feeders as a “superfood” for its great nutritional properties. It is not to be confused with “white tripe” which has been bleached and is therefore unsuitable (and stripped of many of its nutritional benefits). Pilchards are a fantastic source of Omega-3, the one supplement we recommend that your dogs and cats get. 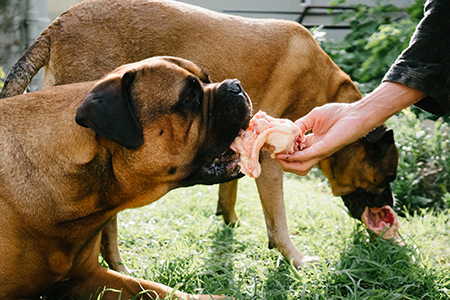 Chomping on raw bones is very good for keeping teeth and jaws strong, and gripping the bones while they chew is excellent for muscle development in the paws, shoulders and backs. 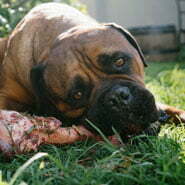 No more dental worries as gnawing on a bone scrapes tartar off the teeth and keeps them clean. Raw meaty bones are an excellent source of natural, highly digestible calcium and other vital nutrients for dogs and cats. Chewing also has a calming effect and counteracts boredom… which not only makes your pets happier but protects your shoes, couches, and coffee table legs! Some of our customers are nervous about Whole Foods at first because they have heard that it is dangerous to feed bones to dogs and cats. Please note the vital difference here between cooked and raw bones! As well as nullifying the nutritional benefits, cooking the bones makes them brittle, and therefore prone to breaking and splintering, which is potentially very harmful for your pet (it can lead to internal scarring, or even bleeding). This will not happen with raw bones, which dogs and cats easily break down and gobble with glee. For dogs and cats with previous dental problems, and for owners who are not keen on the Whole Foods, we are happy to mince these for you so your dog or cat can still benefit from the excellent nutritional value of things like chicken feet. Whole Foods complement the dinners beautifully, and we recommend feeding your dogs and cats something whole two to three times a week. Have a look at our Menu to see the wide range on offer. 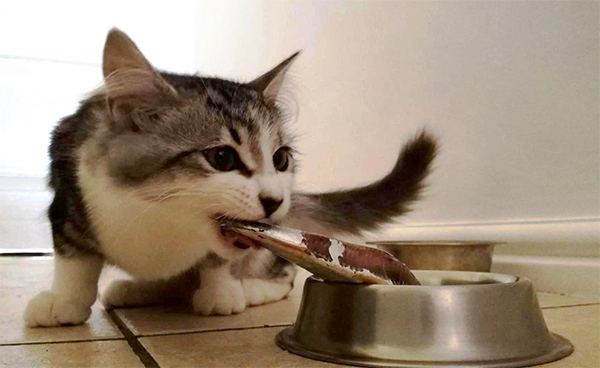 Some of the smaller Whole Foods are especially good for cats – chicken necks and venison ribs are great to start with, and then you can move them on to chicken wings and pilchards. We also offer genuine Free Range Eggs sourced from a local farmer – a whole one is a special treat for our dogs (cats get the yolks only), and we haven’t bought eggs for ourselves from a supermarket since we started stocking them. They are fresh and delicious! Two main schools of thought emerged around natural feeding when the modern movement against processed pet food (pellets / kibble) began in the 1990’s. These are the BARF approach, and Prey Model Feeding or RMB. For us, their similarities are far more notable than their differences. They both support raw feeding, and are committed to feeding dogs and cats as nature intended them to eat. Both promote feeding fresh, raw, real food with no preservatives and absolutely no grains. Cats are obligate carnivores, meaning they categorically must eat meat to survive. Some BARF feeders do put a small amount of vegetable in their diet, but we find that the cats don’t want it, and the experts agree that they don’t need it as long as their vitamin and mineral needs are satisfied. The debate between followers of the two feeding models is mostly about dogs. Some say that one model treats dogs as pure carnivores (like cats), while the other treats them as omnivores. Dr Ian Billinghurst says that dogs are carnivores who also eat vegetable matter. They are scavengers, hunters, and opportunists – in other words, predominantly carnivores who also eat omnivorously (they will eat what they can find in nature). Dr Billinghurst’s Biologically Appropriate Raw Food (BARF) diet of minced, nutritionally balanced recipes therefore includes some vegetables and fruit for dogs, though the majority of the diet is still raw meat and bones. He also advocates the use of some whole foods. The goal of Prey Model Feeding is to imitate the whole carcass of the prey that a dog would eat in the wild. Many will say that Prey Model Feeding (or Dr Tom Lonsdale’s Raw Meaty Bones / RMB) is an entirely meat-and-bone diet. However Dr Lonsdale agrees that wild dogs and wolves do ingest a small amount of vegetable matter through eating the intestines or stomach contents of their (largely herbivorous) prey. So neither diet actually completely banishes vegetable matter, though Prey Model focuses on meat and bones, which are served whole. Prey model feeders recommend a ratio of 80% meat, 10% offal, and 10% bone. Arguments between “Prey Model Feeders” and “BARF” feeders are regularly seen on social media platforms. Our experience tells us that (as one breeder put it), the BARF vs Prey Model debate is an “Imaginary War” as the two camps are actually on the same side (http://www.newcastleboxers.com/rawvsbarf.shtml). Much has been written and said by other cat and dog nutritional experts since this debate began, and their work and research supports this assertion. These theorists include Dr Jon Lumley, Lynn Thomson, Lew Olson, Michelle Bernhard, Margaret Gates, and Dr Eliza Katz, and many others. Dr Karen Becker says it well when she emphasises that nutritional balance is what is important for our dogs and cats, not dogmatic adherence to this or that model. We make special recipes for cats and dogs with specific health problems. 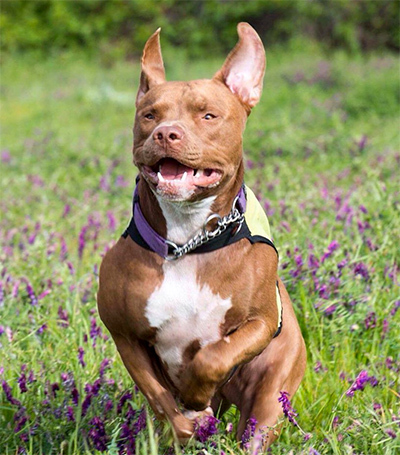 We first discovered raw feeding ourselves when our beloved dog Kismet was so badly afflicted by skin problems caused by hormonal problems and allergies that two vets had recommended putting her down. It turned out that finding the right diet would save her life. Many of our customers have dogs or cats presenting with different health concerns, and it is our special privilege to find the diet that can aid these pets on their path to wellness. These Special Recipes are always developed in consultation with our vet, and wherever possible with your vet too. We have quite an array of existing special dinners from the customers who have come to us over the years, and all the recipes are named for the cat or dog for whom they were originally made. This is list that keeps on growing! If your dog or cat has a particular illness or allergy that we do not already provide for, please speak to us so that we can tailor-make an approach to their food. We have had many success stories with our diet for dogs with skin problems. 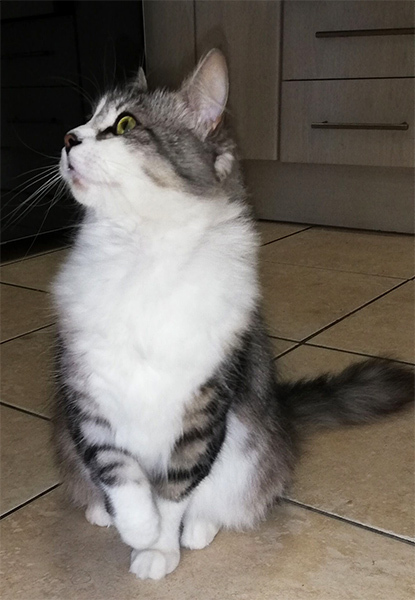 Oscar’s Free Range Chicken Dinner is named for our original miracle boy – go to our Feedback from Well-Fed Friends section to read Oscar’s inspiring story. With skin problems, changing the food is often (but not always) enough. This depends on whether or not the dog is experiencing environmental allergies as well, but limiting the food is a great way to begin to isolate the allergy. For this reason, Oscar’s Free Range Chicken Dinner has far fewer ingredients than our other dinners – it contains only the chicken with a small amount of home-made yoghurt (as a probiotic). It is specifically for food allergy problems, and dogs are put on to Oscar’s for at least two months to clear their systems and start afresh. (If your dog is allergic to chicken, please keep scrolling to read about Lisa’s Venison and Spotty’s Turkey). Once the skin is clear, we determine how to proceed on a case-by-case basis, in consultation with the vet. Please chat to us about your dog’s allergy or skin problem so we can help you figure out the best process for them. Lisa’s Venison and Spotty’s Turkey were first made for dogs who had had full allergy screenings. Spotty was allergic to chicken, and Lisa to both chicken and carrots. These recipes therefore have no trace of chicken – they are made of pure venison and pure turkey respectively (including the bone) with a small amount of fruit, vegetables, and supplements. Before these recipes are made, all our kitchen equipment is thoroughly cleaned to make sure there are no minute traces of chicken or carrot in this food. If your dog or cat has been allergy tested and is sensitive to ingredients other than chicken or carrots, we can happily make recipes that fit with their particular needs – just drop us an email or phone-call, or pop in to the shop to chat! Our usual Cat of the Day cat food recipes are 98% meat and bone (including organ meat) with some yoghurt and supplements making up the balance. 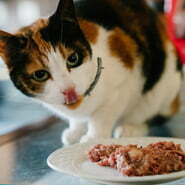 The correct calcium/phosphorous ratio is between 1:1 and 1.5:1 for a normal healthy cat or dog. 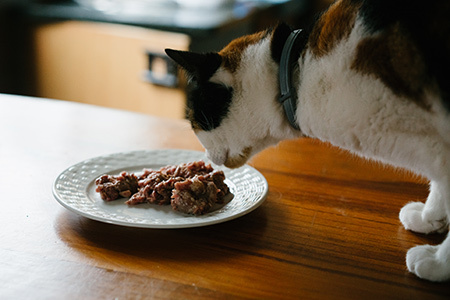 Veterinary specialists recommend that cats and dogs with early and middle stage kidney problems need a special recipe that has moderate amounts of high quality protein, high fat, low or no carbohydrate and sodium, and very low phosphorous. Of course, the naturally high moisture content of raw food also has enormous benefits in both preventing and treating renal problems. Jasmine’s Free Range Chicken Kidney Diet is 93% pure meat, made up of cuts which have been carefully chosen for their lower phosphorous level. It includes egg, homemade yoghurt, and supplements. None of our foods contain any salt or preservatives (salt has been recognised as a contributor to kidney disease). Dogs with kidney problems also need high quality protein and low phosphorus with little or no sodium. Their meals should be high in fat, so Meisie’s Kidney Diet (Give a Dog a Bone) uses a higher proportion of fattier meat cuts than some of our other doggie recipes, such as chicken thigh and leg, and avoids the use of white chicken meat (which can be inflammatory). The meat in Meisie’s is all free range chicken. There is also a higher proportion of low-phosphorous fruit and vegetable matter in this recipe then in our others. High acidity foods can cause damage to animals with stressed kidneys, so we also keep an eye on the PH values in these recipes. At this point, we have only had requests for a Give a Dog a Bone chicken dinner for dogs with kidney problems. We would be happy to explore other protein options as well. Many researchers have studied the role of food in supporting recovery/remission from cancer, and the helpfulness and harmfulness of particular nutrients. Nala’s Free Range Chicken and Nala’s Beef are designed to support dogs who are receiving treatment for cancer, and were made with careful attention to this research. The recipe is essentially a ketogenic diet for dogs, which has also been found to be extremely helpful for dogs with epilepsy and with diabetes. This diet requires very good quality protein, high fat, and no sugars at all. If your dog has one of these health issues, please chat to us about the details to find out if there are appropriate supplements to add that may even further benefit your pet. We actually first made this diet for our own beloved dog Kaesha, who is our walking miracle. She has been in remission from mast cell cancer for six years, and absolutely loves her ketogenic meals! Kaesha had already had a dinner named after her, so she graciously allowed us to name these ones after Nala, who was the second adorable pooch to enjoy these dinners. Nala had T-cell lymphoma, but is happy and healthy now, five years later! Many others have benefited from these recipes, including dogs with epilepsy and diabetes. While dogs definitely require fat in their diets to give them energy, those with pancreatic illnesses and many heart diseases require a much lower fat diet. In these recipes we have excluded any high-fat cuts of meat, including de-skinning where needed. We also use a lower percentage of offal in these recipes than our other ones (many of the organ meats are too fatty) and we have excluded the usual yoghurt and eggs. The recipes are still well-balanced and include all the necessary nutrients. We have a secret, which you can’t tell Willow. These recipes used to be called Xena’s Low-fat Chicken and Turkey Dinners, when they were first made. You can read Xena’s delightful feedback in our Feedback from Well-Fed Friends Section. Willow is there too, of course! Please note – this is not a weight loss program, but a diet designed for these specific illnesses. If your dog or cat has obesity issues, please speak to us as we have plenty of suggestions on how to address these. This is not an exhaustive list of our special recipes, and we are constantly developing new ones in line with what our customers and their pets need. We are also more than happy to share more detailed information on the research behind these recipes, as well as advise on how best to serve them. Please let us know what your dog’s or cat’s special needs are, and we will work with you in consultation with the best vets to get them as happy and healthy as possible. You’ll notice that our “treats” list is the longest on our menu – because everyone loves a treat! All of ours are guilt-free and delicious, and fit right in with the principles of feeding fresh, natural foods. They are made without salt, preservatives or bleaches. We have smaller treats designed for cats and for dog-training use (nothing like a little positive reinforcement! 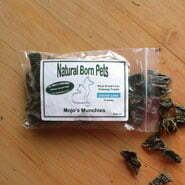 ), and larger recreational treats for dogs. Our range varies from pure dried meat to baked liver treats, from “Bone Broth Ice Lollies” to yummy rooibos- or buchu-infused baked treats. Here are the details of some of our pets’ favourites, but there are many others on the list too – as always, we are here to answer questions if you have any. Named for our very own “Good Boy” Mojo, these bite-sized treats are pure dried beef and ostrich liver—perfect for your training needs. Cats love these little delicacies too. Packed full of nutrients, these bone-broth based frozen delights are the perfect distraction for a panting pooch on a hot summer’s day. One flavour is made with Chicken, Beef, Veggies, Herbs and Turmeric for extra health, and the other with Turkey and Beetroot so that our chicken-allergic dogs can get cool and healthy this summer too. These treats come sealed with a personal paw-print of approval from Cathy’s dog Rocky, and are one of the newest and most exciting additions to our treat pantry. These could be called supplements or treats – they are that packed with goodness. They are the year-round version of our Lick-a-Lot Bone Broth Lollies for both dogs and cats. Cats are not generally fond of frozen foods, so these are made to be defrosted and served. Made from fresh bones of various meat cuts, mixed with some vegetables and herbs, they also have added organic turmeric for its wonder health boost. Unlike a lot of chews available, our raw hide chews have no preservatives. They are handmade, air dried, and are not bleached. We stock a variety of shapes and sizes, so pop into the shop and peruse, or ask us which would be best for your dog or puppy. Chewing is a natural instinct for dogs, and is actually very good for them. It cleans their teeth and keeps their jaws and paws strong, as well as soothing puppies through the teething phase. It also alleviates anxiety and boredom in dogs of any age! Chewing gets a bad rap because it is usually associated with the destruction of shoes, furniture, and other human possessions that we prefer without teeth marks (when Mojo was a puppy he had an expensive taste for cellphones!). So why not give your dog something tastier and more species-appropriate to gnaw on? Please always keep an eye on your dog when you have given them something to chew! 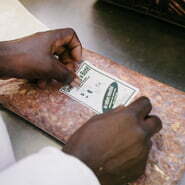 Renee’s all-natural biscuits are made with real chicken livers and no preservatives. They are carefully baked at low temperatures to preserve the goodness of the locally-sourced ingredients, so you can spoil your pets with peace of mind. A favourite amongst our cat clients (some felines demand that you break them into smaller pieces first).These are also great for dog training. These are just a few of the mouth-watering munchies we have on offer. Have a look at our Menu, give us a call, or bring your pet round to the shop and let them choose for themselves! Our dinners are beautifully balanced, and full of vital nutrients, but many dogs and cats with specific needs might benefit from a little extra something. We stock a pretty exhaustive range of supplements, from vitamins to hygiene products to pain relief. The uniting factor is that we only stock natural supplements, remedies, and products that we are truly confident in recommending. There are too many to name here, so we will just describe our most widely applicable ones in detail, but please chat to us if you are looking for something in particular. From hot spots to joint pain to listlessness to waxy ears, we probably have something to help. This is the one supplement that we recommend across the board (dogs and cats alike), and give to our own pets regularly. It is widely known that our modern foods are Omega-3 depleted (even the fresh ones). Our use of Free Range Chicken and Venison means that our meals are higher in Omega-3 than cheaper factory-farmed meats would be. Quite a bit of research has been done on the survival of Omega-3 levels in frozen food. The results are mixed, but some studies suggest that this essential nutrient does not survive the freezing process as well as we would like. So, we recommend that you add it separately for the surety that its maximum benefits are enjoyed by your cats and dogs. Please do not use vegetable oil based Omega-3 supplements (eg hemp oil, flaxseed oil). The bio-availability of these products for cats and dogs is not great compared to fish oil. Omega-3 fats are part of the family of ‘good’ polyunsaturated fats. The list of gains is long and includes improved heart, brain, and eye function. EPA, one of the two Omega-3 fatty acids in fish oil, acts as a natural anti-inflammatory. Fish oil based Omega-3 has been shown to reduce the risk of hot spots, and to contribute to overall clearer and healthier skin, and glossier coats. If you’d like to know more (including how much to give when), please email Chandre, who is ready with an even longer list of benefits and scientific sources on this subject! Virgin Coconut Oil is unrefined and is suitable for dogs, cats, and humans. It can be fed to your pet (mixed in with the food) for a wide range of wellness benefits, or applied externally to help with a myriad of skin problems and sores. Contact us for the full list of advantages. 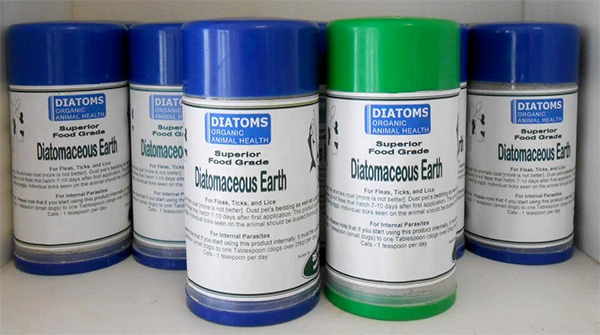 After years of reluctantly using chemical flea treatments, we were so relieved to discover Diatomaceous Earth. It is a completely natural, non-toxic treatment for fleas, ticks, lice, and even other household pests. It kills fleas and ticks by breaking down the exo-skeleton of insects rather than poisoning them, so it is totally safe to use on your pets’ coat, as well as in their bedding, in carpets, around the house, and in outdoor dry areas. Our food-grade Diatomaceous Earth is OMRI (Organic Material Review Institute) listed. This dewormer is especially effective against roundworms, but it also helps to prevent infestations of hookworm and tapeworm. Please note it is not suitable for pregnant dogs! We recommend a routine treatment with it once a quarter, though it can safely be used up to once a month. The ingredients are cinnamon, clivers, fennel seed, garden thyme, slippery elm bark, black mustard seed, wormwood, quassia, cayenne, garlic and Aloe bitters. Please have a look at our menu for a list of some of our other supplements and remedies, or feel free to chat to us about your needs. 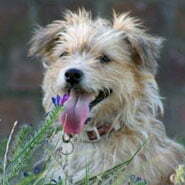 We offer a wide range, including many of Honeyvale Herbs’ pure herbal remedies (like Rebound Arthritis Relief), Ricky Litchfield’s remedies for pain and inflammation (both topical and for internal use), arthritis treatments, various options for relief of skin conditions (did you know Rooibos Oil is often recommended even by allopathic vets before cortisone? ), and of course the “wonder-drug” Turmeric/Curcumin (ask us about the many miracles of Turmeric!). 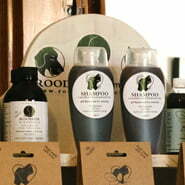 We also have a lovely range of hygiene products such as natural shampoos, soaps and oils, doggie ear-cleaning solutions, and antiseptic wet wipes for pets. …awesome service, concept, food and treats – our fur kids are happy fur kids because of you! Many thanks to Chris and your amazing team for the lovely donation of raw dog food. Many of the rehabilitated canines, “our four legged friends”, have suffered from abuse and neglect, and your healthy ready-mixed raw meals will definitely give them all the nutrition they need to restore their health. We were also so impressed with the neatness and appearance of your pet store. We are truly blessed to be supported by such kind hearted people like you. My dog struggled with terrible skin conditions only a visit to the vet could treat, it was painful for him and costly for us! But within a week of transitioning him to this raw food diet, his skin conditions have disappeared. It has been almost 6 months now without a single flare up! Wonderful people ! fantastic service and product ! Been with them 5 years now and have never let me down! Good business to deal with. They are in it for the love of animals and you can see the owner Chris and his wife are passionate about what they do. Good quality raw food for dogs and cats and they also offer a delivery service which we don’t use as we don’t stay too far. Always happy to offer advice and make recommendations for animal health professionals. Also open on Saturdays until 12pm which is convenient. Highly recommended. This is without doubt the way to go when feeding your pets. Good wholesome health food, just as nature intended!